Superb Hi Vis safety vest for kids in bright yellow and complies with safety specification EN1150. A specially adapted design of adult high vis vests tailored just for kids. 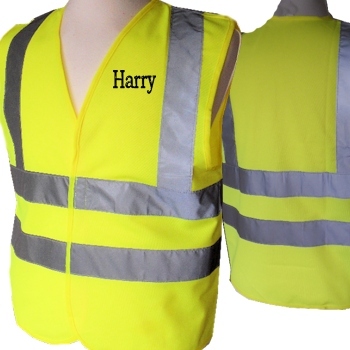 A specially adapted design of adult high vis vests tailored just for kids. With simple front fastening for ease of use for all ages. Quality manufacture complying with safety legislation EN1150. A specially adapted design of adult high vis vests tailored just for kids. With simple front fastening for ease of use for all ages. Quality manufacture complying with safety legislation EN1150. This safety vest is perfect for children walking, cycling or out exploring. available in 3 childs sizes, Small: 4-6yrs Med: 7-9yrs Lg: 10-12yrs. Amys Gifts can personalise this vest for an additional charge. Just choose the yes option and fill in what name or initials you would like embroidered. Please allow approx 3 working days for personalised orders to be made and dispatched.